We are pleased to introduce the May/June 2017 issue of World Neurology. 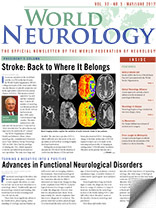 The issue begins with the important news from WFN President Raad Shakir, who reports on the momentous and exciting decision by the World Health Organization to classify Stroke under the Central Nervous System chapter of the International Classification of Diseases (ICD-11). On the topic of stroke, Dr. Wolfgang Grisold, secretary-general of the WFN, and Dr. Mohammed Wasay, remind us that the topic of World Brain Day 2017 is devoted to stroke awareness, prevention, and management. Dr. William (Bill) Carroll, first vice president of the WFN, and the convener of the Global Neurology Network, provides the background and analysis underlying the need for a global neurology alliance to address the global burden of neurological disease. Dr. Grisold and Riadh Goulder, MD, provide their report on the recent and highly successful first African Academy of Neurology (AFAN) Conference & 15th Pan Arab Union of Neurological Societies (PAUNS) meeting that was just held in March in Yasmine-Hammamet, Tunisia. Marina Alpaidze, MD, PhD, and Alexander Razumovsky, PhD, FAHA, report on the third WFN neurosonology teaching course that took place in October 2016 in Tbilisi, Georgia. Dr. Mohammad Bassam Hayek, a neurologist in Aleppo, Syria, and the vice president of the Syrian Society for Neuroscience, provides us with an important on-the-scene update on the recent and current state of neurology and neurological care in Syria. Giordani Rodrigues dos Passos, MD, reports on his recent eye-opening and successful participation in the Canadian/WFN Department Visit Program, where he visited the Montreal Neurological Institute in March. In another successful report from the Rabat/WFN Teaching Visit Program, Dr. Boubacar Maiga reports on his experience from his one-year fellowship in clinical neurophysiology at University Mohamed-V in Rabat, Morocco. Drs. Jon Stone, Ingrid Hoeritzauer, and Mark Hallett provide us with a brief, up-to-date, and authoritative review of the current thinking with regard to the classification, pathophysiology, diagnosis, and management of functional neurologic disorders, including an invitation to learn and share more at the third International Conference on Functional Neurological Disorders to be held in September in Edinburgh. In this issue’s history column, Dr. M.J. Eadie provides us with a historical view of the emergence of clinical neurology in Australia, and the key neurologic figures who contributed to this rich history. Tissa Wijeratne, MD, provides an intriguing biographical sketch of his pathway and journey from the “jungle” of Sri Lanka to becoming a neurologist. Finally, Dr. Grisold and Robert Schmidhammer, MD, provide a heartfelt obituary for Dr. Hanno Millesi, a renowned peripheral nerve surgeon. We sincerely hope that you will enjoy the many and varied contributions in this issue for and about neurology and neurologists around the globe.